We intentionally slowed down the announcement of the release of the Faces of Mass Incarceration documentary-#1. Admittedly, we overlooked some aspects of its promotion and have taken a couple steps backward to move forward more effectively. Our initial notices were met with some questions about the purpose for the documentary, indicating some community members aren’t clear about why it is critical to put a face on the incarcerated and their loved ones. Well………..
Why is It Critical to Put a Face on the Members of the Prison Family? People in general fear prisoners and anything related to prison, including children of prisoners! Putting a face on this feared population will make them less frightening. We hope to reduce the fear-factor to promote acceptance and support of those who are affected by mass incarceration. Many credible studies on the topic of “fear” indicate that above all else, we all fear the “unknown.” In fact, virtually all fear is the result of coming face to face with the unknown, making the unknown the basis of the “Fight or Flight” concept. Why don’t people get to know prisoners and returning prisoners so they won’t fear them? The simple answer is society as a whole hates stepping out of it’s comfort zone and people grow comfortable AVOIDING what they fear. To step out of a comfort zone means facing fears of the unknown, and for the typical citizen anything related to prison is an unknown. We may have the largest prison system in the entire world, with over 2.5 million prisoners, but our country is much larger than that with 321.4 million people. Even if we consider the commonly held belief that each prisoner directly affects 38 additional people by his or her incarceration, we’d only be talking about 95 million people, one-third of the nation’s population. So the majority of our population remains personally unaffected by mass incarceration. That means for about two-thirds of the population “prison” and prisoners are an UNKNOWN and being unknown they become something to fear. Only bad people go to prison, don’t they? So, why would anyone care about them? So how will mainstream society ever know the prison family and get over their fear? They won’t if they keep avoiding the prison family. It’s impossible to know something you won’t even allow yourself to look at; something you refuse to engage with at all. But, we’d like to introduce them to some real Faces of Mass Incarceration, if they let us. If you won’t talk to someone, how will you ever know what makes them tick? You won’t. Of course what you don’t realize with all of the avoidance is that you are shunning and rejecting the very people already standing right next to you at places you work, worship and even play. So, you are already interacting with prison family members all of the time and don’t even know it. That’s right. Because society has shamed this entire population into isolation, they are hidden in plain sight. We’d just like to bring them out in the open and introduce them to you and society. 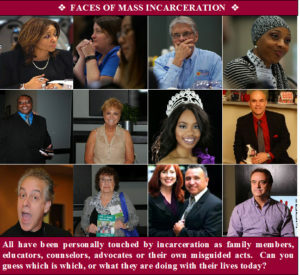 Watch for news on the Faces of Mass Incarceration documentary coming your way. Plan to use the documentary to meet and introduce society to many of the real people affected by mass incarceration. You can already see information about the documentary on this website.